Thanks to layout objects in website builder WebWave CMS you can display the same elements on many subpages. It simplifies managing website and making corrections. If you want to for example change a phone number, you don't have to open each subpage and change number individually. All you have to do is correct it in layout objects. In this article, you will learn how to build a website with layout objects. Layout objects are the foundation of all subpages. It is handy to place in layout elements like logo or menu, which appear on all or at least most subpages. Did you create an amazing header and want it to be displayed on every subpage? It is easy! Select this element and in the Settings Panel add them to the layout. You can add to template a group of elements at once. Read more about a group of elements here. There are two ways to edit layout objects. 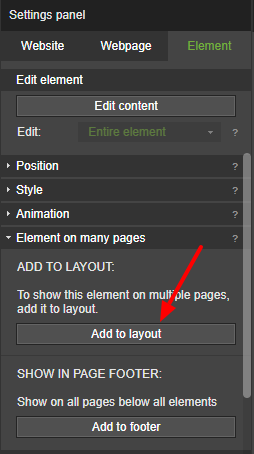 It can be done on subpages by double-clicking on the element or in Settings Panel, where you need to select the object and choose "Edit layout object". Layout objects can be also edited in another, more direct way. In subpages list select "Layouts". 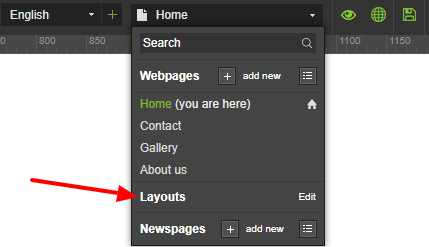 Keep in mind that all changes made in layout objects will affect all subpages with this layout. On layers list, you can see a group of elements named "Layout", where are all layout objects. This group can be placed wherever you want in the layers, between website elements, under or beneath them. It might turn out that you don't want to display layout objects on a certain subpage. 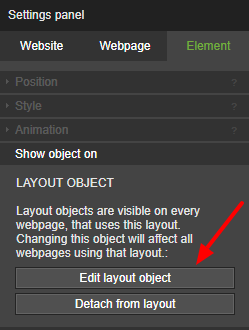 In order to hide them, open a chosen subpage and on layers list hide layout objects by clicking on the "eye" icon. Objects will disappear from this particular page, but will still be visible on others.